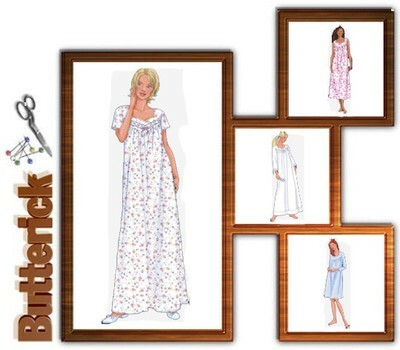 Very loose-fitting, slightly flared nightgown, above mid-knee, below mid-calf or evening-length has self-lined yoke, sleeve variations, stitched hem and purchased trim. A,D below-elbow sleeves. B sleeveless. C short sleeves. D tucks. Notions description...NOTIONS Nightgown A,B,C,D 3/8" (10mm) Lace Edging, 2 yds. (1.9m) for A,C, 21/2 yds. (2.3m) for B and 11/4 yds. (1.2m) for D. Also for B 1/2" (13mm) Single Fold Bias Tape and 1/2 yd. (0.5m) of 1/4" (6mm) Ribbon for C 1/2 yd. (0.5m) of 1" (25mm) Beaded Eyelet Trim and 1/2 yd. (0.5m) of 1/4" (6mm) Ribbon for D 11/2 yds. (1.4m) of 1" (25mm) Beaded Eyelet Trim and 21/2 yds. (2.3m) of 1/4" (6mm) Ribbon. Batiste, Lightweight Broadcloth, Cotton Flannel, Lightweight Satin and Eyelet.